Advent of virtual microscopy in the last decade has revolutionized medical education in many countries. Time has come when our country should also adopt this innovative technology to enrich medical education. However, digitalization has not yet become a part of medical education. Hence, there is a mismatch in the training of medical graduates and postgraduates in digital world and the requirement and expectations from them. Young doctors trained in India are at a disadvantage when they go for further training to other developed countries. There is an urgent need to focus on this issue and take remedial measures in the field. The image is called digital slide or whole slide image or virtual image or e-slide and has the characteristics of the original section. If the scanning quality of the section was not optimal, quality of the image can be improved in terms of color saturation, brightness and contrast with the help of a software. Digital slide can be viewed on the screen of the PC or laptop in any magnification just like a glass slide is viewed under the microscope and any area of the slide can be viewed. Large size monitors or wall-sized screens are very helpful in teaching in class rooms. Image can be annotated to point out salient features which are very useful for undergraduate teaching. However, it must be borne in mind that quality of virtual slides depends upon the quality of the original slide being scanned. The glass slides to be scanned have to be free of artifacts such as folds, knife marks, air bubbles, and stain deposits to get the best results. Most of the vendors provide scanners with facility of scanning traditional slides of 75 × 25 mm size but larger slides of size as big as 200 × 150 mm can also be scanned by some scanners. Many scanners also provide facility for autoloaders where up to 200 slides can be loaded in the racks for automated scanning instead of one slide at a time. 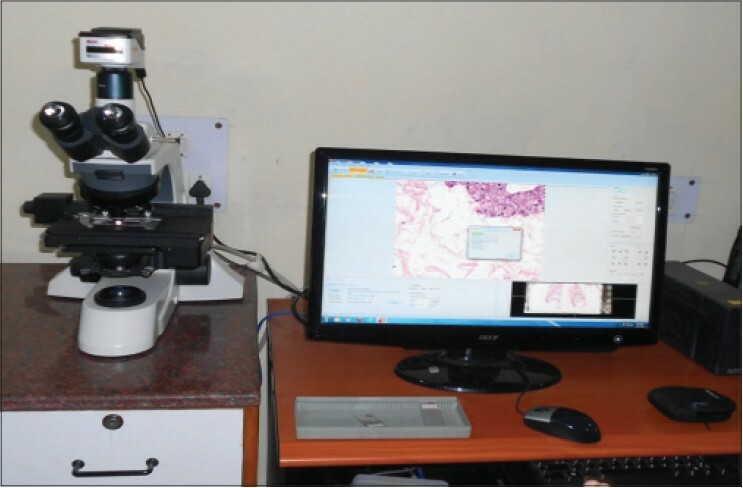 Though globally e-slides are gradually replacing conventional glass slides for class room teaching, we in India are not yet ready for this technology, which enriches medical teaching of morphological subjects like histology and pathology. The virtual slide will become an instrument of bringing uniformity of teaching in various institutions as images will be duplicated and distributed in colleges across the country. Only one slide will be sufficient for teaching millions of students. Next few years are going to witness improvement in the quality of medical education and bring it at par with global centers of excellence. Digital slides will completely revolutionize storage of slides in the departments of histology and pathology. Instead of glass slides, E-slides will be stored in the computer disks. Compilation of slides will be computerized and retrieval will be easy. Physical space will not be required for storage of slides. Digital slide libraries will be excellent for self study by the residents. This application is the most popular for pathologists and oncologists. Opinion on difficult and cancer cases is sought from renowned expert pathologists located across the world. Our center has also been seeking opinion from experts by sending digital images over web server to expert pathologists [Figure 3]. Opinion is obtained within hours via internet. If need is felt to discuss the case, this is done through Skype and final report is prepared. This method of getting second opinion has become very popular among clinicians as they do not have to wait for long to obtain international opinion and they can start appropriate therapy. In addition, patients are benefitted since they do not have bother about sending duplicate slides and blocks overseas with its risk of loss during transit. Most importantly, the period of anxiety for the patients and their families is tremendously reduced and treatment is received by the patient at the earliest. Use of digital pathology is highly recommended for second opinion. Digital slides are a great tool for presentation of scientific data in seminars, symposia and conferences. I have been personally using digital images for conducting slide seminars in conferences, continuing medical education programs and workshops. 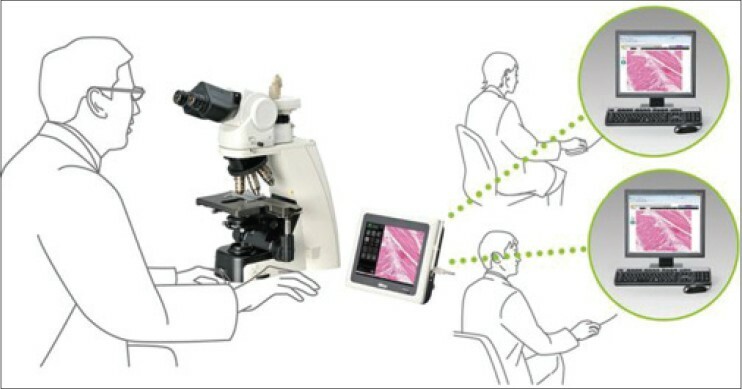 Digital images give the freedom of showing different areas under various magnification from panoramic view of the lesion to the highest magnification. This gives transparency in presentation as there is no bias in area selection by the presenter. For conducting slide seminar, there is no need to prepare glass slides. This tool is very helpful for discussion of rare cases for which only one slide is available or for small endoscopic and core biopsies where tissue is not sufficient for multiple sectioning. Time is not far when instead of glass slides, digital slides will be demanded for evaluation of scientific data and for purpose of publication in research journals. At present high cost of the scanners is the main reason for slow adoption of digital pathology by institutions and laboratories. It is believed that the cost of scanners will come down with increasing volumes of business, which will help in rapid growth of digital pathology for various applications in our country. 1. Chandra M. Virtual microscopy- Technology of new millennium. J Odontol Res 2013; 1:1-3. 2. Kumar N, Chandra M. Whole slide imaging in medical and dental education. J Med Erudite 2013;1:45-51. 3. Betigeri AM, Aparna P, Pasupathi P. Could India become the digital pathology hub of the future? A consideration of the prospects telepathology outsourcing. Int J Biol Med Res 2010;1:300-2. 4. Samraj T. Virtual microscopic method of teaching histology. J Orofac Health Sci 2011;2:43-4. 5. Baruah MK. The practice of telepathology in India. J Postgrad Med 2005;51:316-8. 6. Weinstein RS, Graham AR, Richter LC, Barker GP, Krupinski EA, Lopez AM, et al. 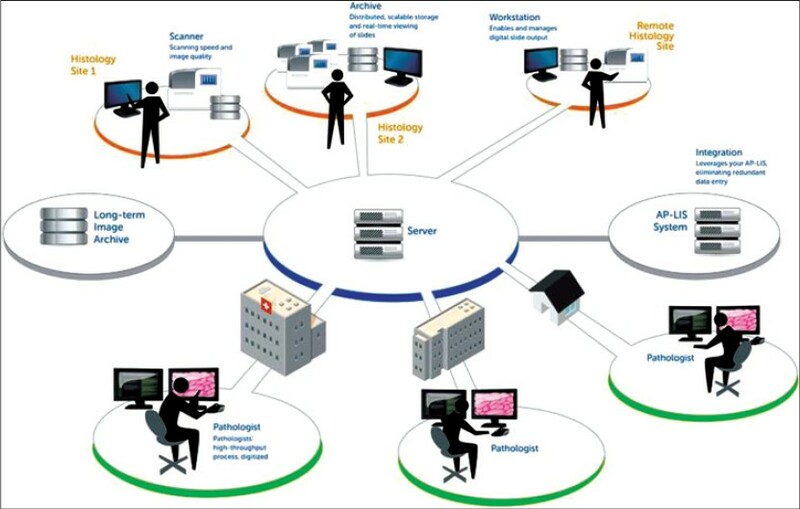 Overview of telepathology, virtual microscopy, and whole slide imaging: Prospects for future. Hum Pathol 2009;40:1057-69. 7. Dee FR. Virtual microscopy in pathology education. Hum Pathol 2009;40:1112-21.